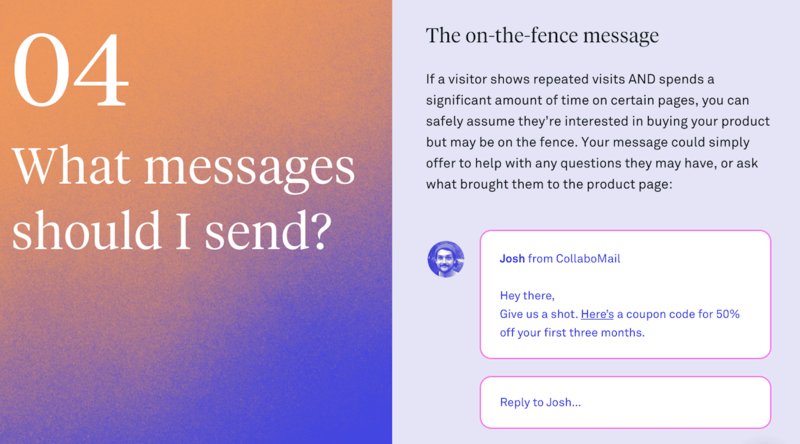 At Intercom, we’ve spent years learning first hand the benefits – and challenges – of making it incredibly easy to chat with your website visitors. And it’s working. Based on our own research and analysis, visitors who engage in live chat are 82% more likely to convert to customers. But we know you don’t have the bandwidth for lots of real-time conversations that potentially lead nowhere, so how do you ensure you’re having valuable conversations with potential buyers rather than time-wasters? The most effective way to make live chat an ROI-positive activity is to proactively message the right visitors with the right message. Today we’re launching the Live Chat for Sales Starter Kit that shows you how to do exactly that. Proactive messages, which we call Visitor Auto Messages (VAMs), allow you to reach out to targeted segments of your website traffic with a short, relevant message. They act as a natural filter for low-quality leads; for instance, perhaps you only proactively message visitors on your pricing page, rather than on the homepage. In this starter kit you’ll get best practice advice and sample messages, so you can quickly create a proactive messaging strategy. Implementing it can take minutes with the right product (obviously we’re biased and use Intercom, given we’ve built an entire solution to do exactly this job). But no matter what live chat product you use, the principles in this guide apply. Lastly, read about how an Intercom customer used a simple VAM to quadruple the number of product demos scheduled for their sales team. Live chat is the most low-friction way to talk to visitors on your site, but the other side of that coin is that it’s the most low-friction way to talk to visitors with no intent to purchase. Use proactive messages to engage and capture your best leads before they bounce from your marketing site. Ready to learn all about proactive live chat? Head this way.